Right around Cyrene Quiamco's 30th birthday, Snapchat came through with a gift: a brand hookup. The popular Snapchatter, who goes by CyreneQ, was selected to help promote McDonald's new donut sticks. Over the past two weeks, she has posted videos on Snapchat about the churro-shaped pastries; she has created a Lens featuring a box of donut sticks with powdered sugar sprinkling down; and she has shared them with her Snapchat sidekick Ele, an augmented-reality character on the platform that she created. Quiamco earns $30,000 for each Snapchat Story that mentioned McDonald's. "It's my birthday week," Quiamco told Ad Age last week. "I sent a story to my fans today saying, 'What's better than birthday cake? McDonald's donut sticks with my sidekick Ele.'" Quiamco finally turned her work on the platform into a paying gig as part of Snapchat's commitment to helping creators make a living from their work. For months, Snapchat had promised direct support for its top users, but struggled to make progress. As a result, it lost some of its most popular storytellers to rival platforms. But now there are signs that Snap may finally be turning a corner, with opportunities like Quiamco's representing a sign of good faith, and possibly future collaborations, between the company and its standout creators, particularly when it comes to those working in AR. Snapchat has an early lead in augmented reality, and this head start is crucial for the company's future. It has already seen Instagram overtake it in Stories after copying that format, and the photo-sharing site is now gunning for Lenses. If Snap is going to remain ahead of the pack, it needs to keep AR creators like Quiamco happy and prevent them from defecting. 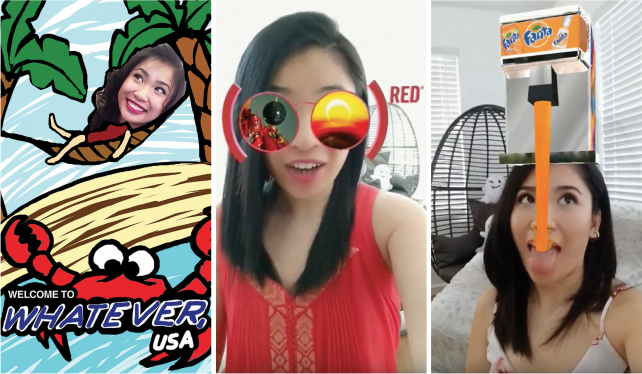 Melding AR and influencers is a new phenomenon, and one that could allow Snapchat to stand apart from rivals to defend its talent pool. "I've seen no slowdown on brand interest for AR," Quiamco says. "For AR creators, Snap is the app to go to. For other types of creators, it's still a different story." Quiamco is a founding member of Snapchat's official creator communities for Storytellers and Lens makers, which started last year as a gesture of partnership between the company and its most ardent users. Snapchat wanted to show that it could build a platform like YouTube and Instagram that financially supports these influencers, the people with the creativity and sway to keep the rest of the audience tuned in to the app. However, late last year, one of Snapchat's most famous homegrown stars, Shaun McBride, said goodbye to the app, and others in his circle were following. McBride said he had received emails with supposed opportunities to work with brands, but they didn't lead to any deals. Quiamco says the most disillusioned creators have been the Storytellers like McBride, specialists in Stories videos who could go to Instagram or even TikTok and find millions of followers. Stories play on all Facebook apps, and reach 500 million people a day on Instagram alone; it's a magnitude Snapchat just can't touch. "TikTok does seem to be hitting hard for people trying to be funny, famous," McBride wrote in an email. "But I think Snap users just moved to Instagram mostly, where they get a better product." Yet while Snapchat has struggled to fully deliver in terms of audience scale or sponsorships, it has continued to outpace its rivals when it comes to innovation. "Snapchat is way ahead of Instagram technologically," says Clay Weishaar, a Los Angeles-based creative designer. "Snapchat allows creators to do things Instagram can't currently do and it's a lot more brand-friendly." One example of this is Snapchat's Lens feature. Lenses started out as just fanciful add-ons, turning faces into puppies and shooting rainbows from open mouths, and eventually developed into one of Snapchat's most innovative ad formats. Snapchat has 186 million daily users, and 70 percent of those people play with Lenses every day, according to the company. In 2017, Gatorade had the first Lens for the Super Bowl, which virtually soaked people in the sports drink. The technology evolved, with 3D Lenses that inserted AR objects into the frame, as when Warner Bros. designed a futuristic car from "Blade Runner 2049." Last year, AR became shoppable, letting consumers try on digital versions of clothes and makeup and then linking to an option to buy. And while Facebook has its own program for augmented-reality creators, the general consensus among the AR community is that Snapchat's studio is easier to use and includes better features. Snapchat's AR is noticeably more polished; the effects track to people's movements in the camera more cleanly and with fewer glitches. Snapchat approves Lenses within hours, while Facebook can take days vetting each one through human review, according to multiple creators who use both platforms. Instagram also still has a strict no-brand policy, so the independent creators are prohibited from working on marketing campaigns with companies not preapproved by Facebook. Meanwhile, Snapchat is open for business: "We've had Snapchat come by the agency and give us training on how easy it is to prototype and even launch a Lens," says Azher Ahmed, director of digital at DDB U.S. Augmented ad campaigns used to cost hundreds of thousands of dollars and required working directly with Snapchat's in-house designers, but they can now be built in Lens Studio with no minimum spending requirements. But Snapchat's first-mover advantage may be short-lived, since Instagram is reportedly on the verge of opening AR to brands. "They're telling us there will be first a beta stage pilot, maybe this spring or summer," says one Instagram AR developer who spoke on the condition of anonymity. The AR community is still mostly hidden on Instagram, and regular users aren't allowed to access filters unless they follow a few anointed accounts. Yet despite all the augmented-reality restrictions, Instagram is looking like a potential goldmine for creators. Johanna Jaskowska, a designer based in Berlin, created one of the first breakout hit filters on Instagram in January, which applied a metallic shine to people's faces and played with the lighting on their hair. Jaskowska says it was viewed by more than 300 million people on Instagram, and her personal account went from 2,000 followers to 600,000 followers. Snapchat will struggle to compete with that kind of scale, which is why delivering business opportunities to its top creators remains a priority. In February, Snapchat tapped Lens creators Shaun Lakey, Alie Jackson and Ben Knutson to attend the National Basketball Association's All-Star Weekend to work with Nike and Jordan Brand, teaching kids and basketball players how to make Lenses. Snapchat paid the creators $7,000 each for the weekend. "This Nike event came up, it was awesome and we did get paid for it," says Jackson. "So Snapchat has definitely created opportunities."